This week on the show we explore the dynamics and play style of the DCC Tournament Funnel. 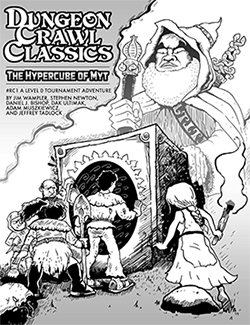 Invented by Harley Stroh and debuted at Gen Con 2014 with his adventure “The Seven Pits of Sezrekan,” the tournament funnel has proven instantly popular with convention goers, and is now being featured in Road Crew 2015 releases from Goodman Games, starting with “The Hypercube of Myt.” Joining us to explore this new adventure phenomenon is David Baity, who’s own tournament funnel “Carnival of the Damned” met with wide acclaim at Gary Con VII. Great to hear your voice Dave! I’m excited to play a role in getting your adventure out there for folks to enjoy: it really is excellent. And what a treat to have Spellburn back. Missed you guys! Great show as always. I enjoyed hearing David on the show. I was in his Carnival of the Damned 0 level funnel and it was a blast. David is a great judge and I look forward to buying this adventure when it comes out. Another great episode. After listening to the episode I am a bit confused on the dynamics of the tournament funnel. How does the “waiting to play” line work and also, something was mentioned you might hand off a character with 1 hp remaining.. I just don’t understand how or when these things trigger. Michael, when a PC dies, they get the “DEAD” stamp of doom and are ejected from the game — at which point the next player in line gets a spot at the table and the player with the dead PC goes to the end of the queue. Those in line just wait for other PCs to get ganked so they can get back to the table. Also, everyone is given pre-generated 0-level characters, and many of them only have 1 hp when starting out! Perfect. Thanks for the explanation Jen! After listening to the latest episode I really want to try running a tournament funnel. If I can pull it off, I’m going to aim for a table at free RPG day at my local FLGS for a public game. Before I did this I was hoping to test run it once or twice with my own group. The issue I’m having; I’m not finding anywhere to purchase any of the tournament funnel modules that I find reference too. Are there any available that you know of and/or can point me to. Thanks. Took a while to get a chance to listen to this, but now I want to own a copy of Carnival of the Damned! Dave and Jon, get it to the presses!